As the wiki explains, aquaculture now represents about half all the fish the human race eats! In the bad old days of ‘by-catch’ fed aquaculture, fishing ships would scrape the ocean floors clear of life as they bottom-trawled every sea creature imaginable. Seafood was sold to fisheries, and all the inedible stuff – the so called ‘by-catch’ – was ground up and turned into fish feed for land based aquaculture farms. This system replaces ocean ‘by-catch’ with microorganisms grown in nearby tanks. The microorganisms are fed various fertilisers. Or it can be grown in the prawn farm’s own prawn ponds in the 6 month off season. Half the world’s seafood is farmed, so this is huge! A team of CSIRO scientists has cracked the holy grail of aquaculture by developing the world’s first fish-free prawn food. The royalties from worldwide licensing deals for the Novaq product will earn the CSIRO tens of millions of dollars. “The research cost about $10 million. We are very confident that this will generate a return on investment back to Australian taxpayers of many, many times the initial investment,” CSIRO’s Dr Nigel Preston said. There is intense global interest in Novaq because it solves one of the farmed prawn industry’s biggest problems – its reliance on wild fisheries as a core ingredient in prawn food. But aquaculture has reached “peak fish”, where demand for wild harvested fish meal now outstrips supply. Without a solution, soaring world demand cannot be met. “It is absolutely a critical issue for the global aquaculture industry. There’s no more room to get more wild harvest fish, so we’ve got to find alternatives,” Dr Preston said. This is really a game-changer. There’s nothing like this that I’ve seen in my career and I may see nothing like this again. News of Novaq’s development has caused huge excitement around the world, as many thought a fish-free food was impossible. 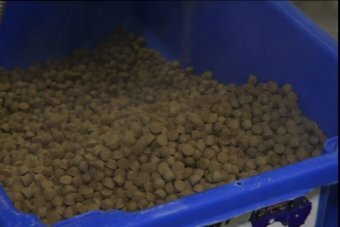 “It’s the first really viable solution to not having to use wild harvest fish meal,” Dr Preston said. Australia’s only producer of prawn food, Ridley, has the licence to make Novaq, and aims to have it on the market by the end of next year. Ridley’s Bob Harvey says the industry will be able to flourish when it is no longer reliant on fish caught in the wild. Ridley is aiming to sell the product to the world’s biggest producer of prawns, Asia. “There is a world shortage of prawns, there’s an insatiable demand in South-East Asia for them,” he said. Mr Harvey says the opportunity is worth millions of dollars to the company. “It’s a long journey now to start to commercialise this, but the prize is significant,” he said. The Novaq formula is a closely guarded secret, but it is known that the product is based on microscopic marine organisms. “They are so abundant one would have thought that the world would have paid more attention to them, but their misfortune is to be so small,” Dr Preston said. Marine microbes are at the bottom of the ocean food chain and a decade ago scientists knew little about them. The CSIRO team’s first breakthrough was working out how to feed and then farm them. “They are harvested when they are 40 days old. We then de-water the product. We drain it down and filter it and then we harvest the product as sludge or … a mud,” said CSIRO’s Dr Brett Glencross. Novaq has delivered a second breakthrough, with scientists discovering prawns grow up to 40 per cent faster on the fish-free food. “If you think of that in terrestrial terms, it’s very rare to see,” Dr Preston said. “If you’ve got a chicken growing 40 per cent faster you’d think something was wrong. It was a surprise. With farmers able to get more tonnes of prawns per hectare of pond space with the same input costs, the new feed will have a huge impact on profits and productivity. It’s going to make the animals grow better and bigger … it sounds like the magic cure. 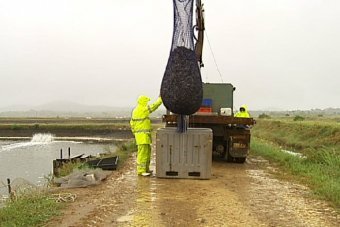 “Farmers can either get their prawns to market 30 per cent faster or they could have a prawn that’s 30 per cent bigger,” Dr Preston said. Novaq offered more surprises by proving more nutritious than traditional fish-based feeds. Prawns fed the new diet were healthier and more robust. “There’s opportunities to start lifting carrying capacities in ponds and start to push more animals out, but the thing that excites us more is that growth potential,” said the manager of Australian Prawn Farms Matt West. Australian Prawn Farms at Ilbilbie, south of Mackay, has 33 hectares of ponds, and hopes to triple production by digging more on adjacent caneland. Its plans have been hampered by a lack of access to power and tough environmental rules, but Mr West hopes Novaq can deliver an increase in yields without the need to push ahead with the extra ponds. “It’s going to make the animals grow better and bigger and stronger and more healthier … it sounds like the magic cure,” he said. Novaq’s arrival is perfectly timed, as supermarkets and customers increasingly demand seafood that is certified as sustainable. “We as an industry do want to be clean and green, we want to go down more of the sustainability path and this is just one of the little ventures that we can do … it has a sustainability tick,” Mr West said. Dr Preston hopes some of the millions of dollars the CSIRO earns from Novaq royalties will be spent finding the same solution for farmed fish. It is a much bigger market, but it is also more challenging. “Because prawn feeds have about 25 per cent wild harvest fish meal in their formulation, with fish it’s 40 to 50 per cent, but we do have the germ of an idea as we had for Novaq 10 years ago,” he said. Dr Preston says it is crucial the work is done, as the aquaculture industry cannot grow unless it finds an alternative to current feed containing wild caught fish. “One in two fish that everybody eats around the world is farmed so if we’re going to continue to eat more fish, if we’re going to meet those demands for the world’s ever growing population, then it’s going to be farmed seafood,” he said. “And if it’s going to be farmed seafood it absolutely needs to be sustainable. “We need to double fish production in the next 50 years … so we need to come up with some innovation and I think providing Novaq for fish is probably the next step.’ Dr Glencross said. Landline’s story on the Novaq breakthrough is on Landline on ABC1 on Sunday at noon.